Xbox Live is working across the Xbox One and Xbox 360 platforms this morning, a day after the service was down for many. 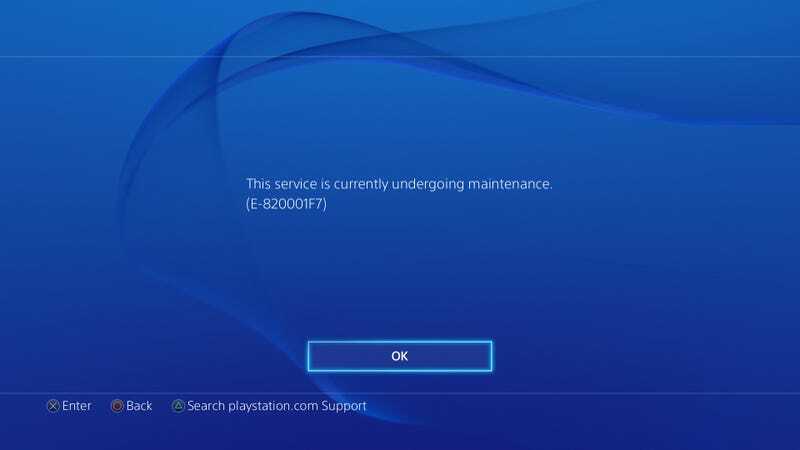 But the PlayStation Network was down for "maintenance" on the PlayStation 4, according to a system message. Xbox Live appeared to come back to something close to normal functionality late Christmas night, finally allowing Xbox One users to log into Xbox Live after a day of spotty service, at best. As of 11:00pm ET last night, I had been able to log onto Xbox Live on my Xbox 360 but could not on my Xbox One. Without being able to log in, I couldn't download games, play online or even access the pinned app icons on my system dashboard, which are saved in Microsoft's computing cloud. PSN had been working on my PS3 last night but not on my PS4, preventing me from accessing the PlayStation store or play games online. It is possible that Xbox Live and PSN were knocked offline due to heavy use on Christmas day—we've seen their networks get flooded by new users before. But the prevailing concern is that both were actually disabled by an online collective called Lizard Squad through DDoS attacks, attacks that overwhelm networks with traffic until they slow down or stop working. Lizard Squad had claimed that they would attack both networks for Christmas (For the laughs? It wasn't clear why) and then claimed to stop them by around 9pm ET last night. A Microsoft rep declined to tell Kotaku yesterday why Xbox Live was down. Sony has not replied to our request for comment.